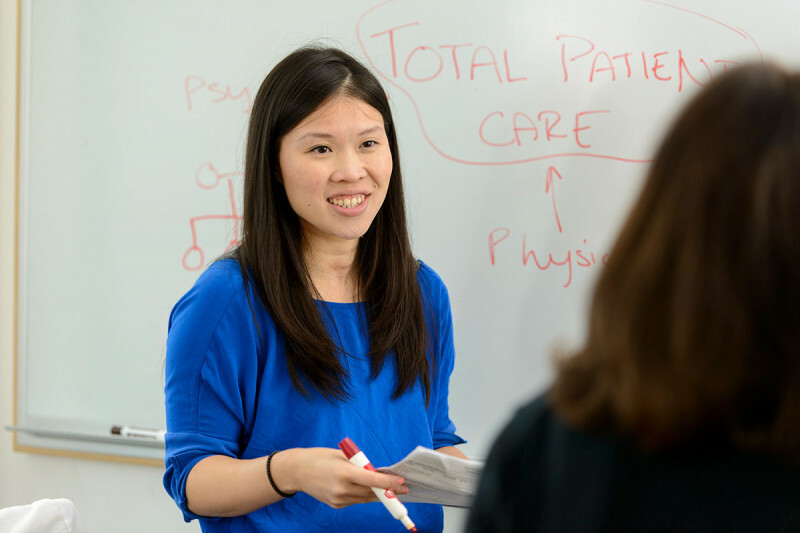 Nurse Kimberly Chow focuses on helping patients cope with cancer pain. People with cancer may have pain from the disease itself or as a side effect of treatment. A doctor will try to identify what is causing the pain by taking a medical history and doing a physical exam. Advances in diagnostic imaging allow the care team to find the causes of pain much more conclusively. Cancer pain can be directly related to tissue damage. Tumors can destroy or press on tissues, bones, or nerves. They can also cause blockages in hollow parts of the body, such as the digestive system, blood vessels, and lymph vessels. Pain can result from cancer treatment too. This most typically happens after surgery. It can also sometimes happen after chemotherapy, immunotherapy, or radiation therapy. Muscle aches can develop during or after treatment because of lack of physical activity. Neuropathic pain is caused by an injury to or compression of nerves or other parts of the nervous system. Visceral pain is caused by injury to an internal organ, such as the liver. This pain is often hard to pinpoint. It can be throbbing, aching, or sharp. Somatic pain primarily involves bone. It can usually be pinpointed to a specific place on the bone. It too can be throbbing, aching, or sharp. Accurate diagnosis of the cause and type of pain is key to finding the most effective treatment for an individual. Pain medications include nonsteroidal anti-inflammatory drugs (NSAIDs), opioids, antidepressants, and anticonvulsants. Neuropathic and nociceptive pain respond very differently to these medications.